4th March, 2011. Are you a winner? We announce 5 more winners in the Redarc Promotion! Plus we launch the NEW ExplorOz Australia-wide Events Calendar. Check out the latest news regarding what permits you need and where to go to get them. See the latest new products just arrived in store and grab a bargin in our Super Specials. 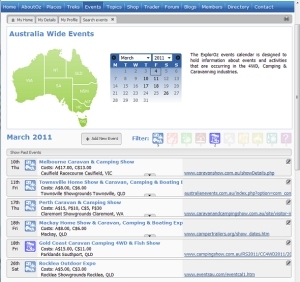 ExplorOz now produces a fantastic, interactive Australia-wide Events Calendar. Ready for the launch, we have listed all the major 4WD/Caravan, Camping and RV shows around the country but anyone can add a new event for any of the available categories which include Music Festivals, Hobby/Craft Shows, Field Day/Ute Musters, Boating/Fishing Shows, Comps/Races, Trips/Social Events, Rodeo/Outback Festivals, & Food & Wine Events. Everyone is welcome to add and promote any suitable industry events (commerical, charity or otherwise) including the website link. In a future development, we intend to enable Members to tag themselves to any events, plus we will merge our existing Members Trips/Gatherings into this calendar (existing organisers we suggest you may like to create a new Event in the calendar and link to the current page in the meantime). You can find Events on the site menu, and the next upcoming Event for each state is listed on the ExplorOz Home Page. The ExplorOz Camps Finder has nearly 5000 waypoints, descriptions and details Australia-wide! Utilising our powerful Places database powered by iMapPlot technology, this is a fully interactive tool with online mapping features to enable you to easily find other nearby services and features. Member Benefit: free download of all GPS data! 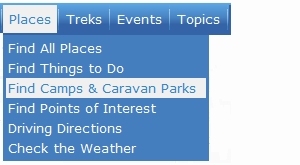 You can find the Camps Finder in the site menu listed under "Places" - which has a new submenu featuring loads of other new links! Our fantastic Redarc Promotion continues with a whole NEW promotion with more great prizes and ways to win. This month, anyone who spends over $150* in the ExplorOz Shop has the chance to win 1 of 2 Redarc "Smart Start" Battery Management Systems, each worth $1595 ! If you're not already a Member, this transaction value would also mean you qualify to receive free ExplorOz Membership (worth $50). This will appear automatically in your cart. 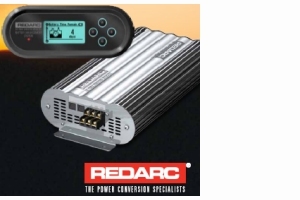 Plus, each fortnight until 31st May, we are also giving away 1 Redarc "Smart Start" Dual Battery Isolator. Plus, all ExplorOz Members as at 31st May will go into the Major Prize Draw to win a prize pack worth $2,255 containing a Battery Isolator, a Battery Charger, and a Battery Management system. If you're a winner - be sure to contact us within 7 days to claim your prize. These people have until Friday 11th March to claim. See all details on how you can be a winner in this great promotion sponsored by Redarc Electronics by viewing the full terms & conditions online. You can now buy a variety of 4x4 Equip’s 12V Battery Packs from ExplorOz, available in 7Ah, 18Ah and 37Ah. These packs are fantastic portable power solutions for when you’re on the go, and depending on which option you choose, can power anything from your camp lights to a fridge. The 7 and 18Ah packs can be charged either on the move from your vehicle, or from mains power. The 37Ah pack comes with a 5 stage fully automatic charger. We have just conducted a total update of the entire Permits section on ExplorOz, ready for the start of the outback travel season. Also see the ExplorOz Treks for inspiring ideas on where to go - we have over 900 routes, with online mapping tools and all can be downloaded free if you are a Member. Unfortuantely, whilst our poll asking "Should ExplorOz Create another Trivia CD?" has resulted in a 70% YES response, no volunteers have stepped forward to make this possible. This was intended as a fun project to involve our audience in preparing the Questions & Answers and we will fund the cost and coordiantion of studio recording and production. This task can only happen if we find a volunteer by 17th March - interested? ExplorOz welcomes its new sister! I.T. Beyond Pty Ltd , the creator, owner and publisher of www.ExplorOz.com is very proud to announce that we have just created a new website based on the same Community concept and taken this out to the Triathlon & Multisport market in Australia. This new site, called TriathlonOz.com, has similar ground-roots to ExplorOz, in that the owners, David and Michelle Martin, have built the site around their personal involvement in the sport. In fact, David has qualified for the World Championship 70.3 Triathlon, which will be held in the United States later this year. The reason for TriathlonOz.com, is just as it was 11 years ago when we started ExplorOz - there is no other community/resource site in the Australian Triathlon market of this nature, so we are hopeful that TriathlonOz can be just as useful to the athletes as ExplorOz is to adventurers. The site is very much in its infancy so please help us promote TriathlonOz by telling your friends, or using the Facebook Share & Like buttons. Please be advised that Western Australia will be enjoying a long weekend, with Monday 7th being the Labour Day public holiday. Our office will therefore be closed on the public holiday.